Of all the luxury brands present in India which are becoming a common sight with every passing day, Jaguar still enjoys a certain level of exclusivity. Mostly due to their designs or a pricing that makes buyers look for cheaper alternatives elsewhere. But the latter has changed with the advent of a new Jaguar XF ? as you may have deduced from their latest marketing campaign for the car which seduces you to "Own a Jaguar for the price of a car". The Jaguar XF has become marginally easier to own with the introduction of the new 2.0-litre petrol variant that we have tested here. 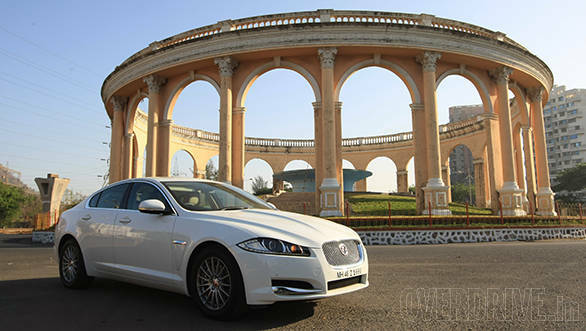 Launched a few days before the 2014 Auto Expo for Rs 48.30 lakh ex-Mumbai, the Jaguar XF 2.0 petrol doesn't announce to the world that it is the cheapest Jag out there. 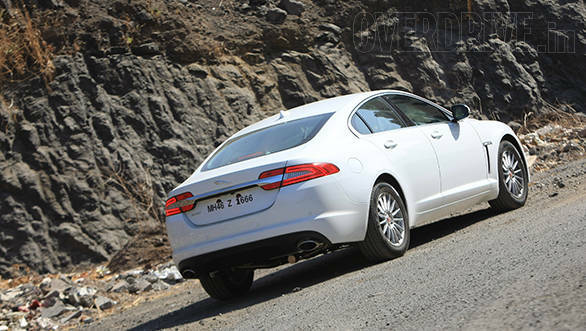 There isn't any variant badging and unlike the entry-level diesel XF, which gets a single exhaust pipe, this one continues to use the sportier two-pipe design. In the front, it wears the same fascia and headlights with LED DRLs and auto-levelling projectors, but the latter lose out on the cornering lamp function. Save for the 17-inch wheels and higher-profile tyres compared to the 3.0-litre diesel powered XF's 18-inchers, the car looks every bit as stunning as the range topping XF. Though the model has been around in the market for quite some time now, it still manages to get a second look and that is what bumps up its desirability quotient. Jaguar offers the XF 2.0 in the 'Luxury' trim, which means the standard interiors come draped in beige upholstery, a black dashboard and stain-finish accents. 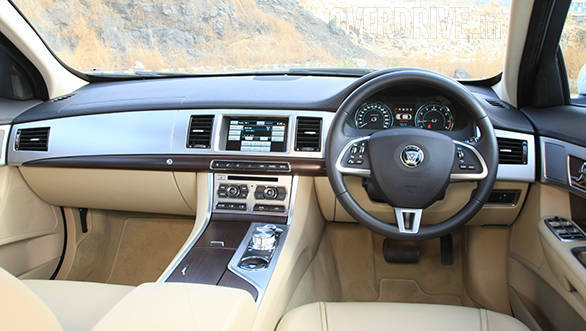 Jaguar offers the XF 2.0 in the 'Luxury' trim, which means the standard interiors come draped in beige upholstery, a black dashboard and stain-finish accents. The leather and the soft-touch plastics have larger grains for their texture and are therefore visibly different than the ones in the top-spec model. The front seats get six-way electrically adjustable functions for rake, recline, height and reach. The headrests are manually adjustable. Standard features in the car include a 7-inch display for the infotainment which comprises a TV tuner (only Doordarshan in our case), a 250W audio system, Bluetooth connectivity and satellite navigation. The audio system sounds great and probably you will enjoy it more since the engine powering this car is quite silent and makes for a quiet cabin. Speaking of quiet, the 2.0-litre petrol engine is the talking point of this car. 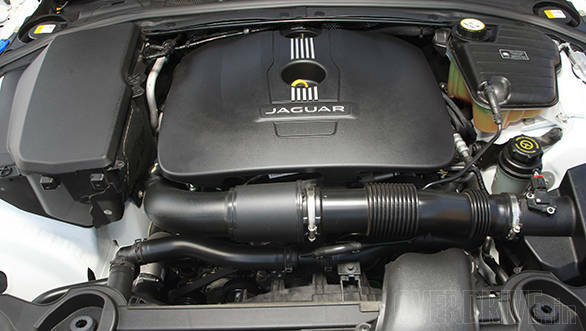 To begin with, this engine presents Jaguar in a very different way. What has been known as a brand represented by V6 and V8 mills, now sees the introduction of a four-cylinder motor for both its sedans in the wake of better efficiency and lower emissions demands. Undoubtedly, it will filter down to the upcoming XE sedan as well. It isn't an all new engine though. It is essentially the Ford EcoBoost 2.0 which debuted back in 2008. In the XF, it produces 240PS of power and 360Nm of torque. Therefore on paper, this engine packs more firepower than its German counterparts in the Audi A6 2.0 and the Mercede-Benz E-Class E200. But at the same time, it claims the least fuel economy out of the three at 10.8 kmpl. Our test car returned us an overall fuel economy in the range of 9-10 kmpl. Ford says that this turbocharged engine provides the same level of performance as a V6 while being more fuel-efficient. Jaguar's claim of a 7.9s 0-100 kmph sprint cements that fact. However, the best sprint we managed on the XF 2.0 Petrol was 8.9s. Reaching 200kmph isn't a problem for the this mill. And the engine's refinement and quietness means that you do not realise what speeds you are doing until you glance at the speedometer. It does emit the smooth note of a four-cylinder motor past the 5000rpm mark though. The engine is quite sprightly and is complemented by an eight-speed gearbox that is always eager to downshift, no matter what the driving conditions are. It can get annoying in city environments though, as the setup tends to present a very strong low-end. In fact, at most traffic light stops, the engine would choose to get off the mark in the second gear when on part-throttle. The gearbox is quick to respond, but if you plan to indulge yourself in some spirited driving, resorting to the paddle shifters is a better option. That said, running fast around the twisty roads doesn't seem to excite this cat. There is a fair amount of body roll and the front-end feels a tad too light. Moreover, the steering wheel has a vaguely soft at-centre feel which hampers feedback and doesn't make it a fun car to tackle bends with. The suspension setup works well on our road surfaces. But while it absorbs most undulations with utter ease, the sharper bumps or medians make the ride feel choppy. Nevertheless, the overall ride quality is quite comfortable no matter which part of the car you are seated in. Let's sum it up then. In terms of features and design, the XF 2.0 doesn't make you feel like you are making a compromise. Though pricier than its German rivals, it promises exclusivity and more flash for the buck. Also, this is now the only standard XF that you can buy with a petrol engine unless you are enthusiastic enough to shell out extra dough for the XFR. Therefore, if your yearly mileage isn't going to exceed 30,000km to justify buying the diesel XF and a good luxury runabout is what you seek, then this entry ticket to the Jaguar brand is well worth the money.